Elsie Seetoo was 25-years-old when she joined the U.S. Army Nurse Corps in China to help the American forces in WWII. Last September, Seetoo celebrated her 100th birthday. 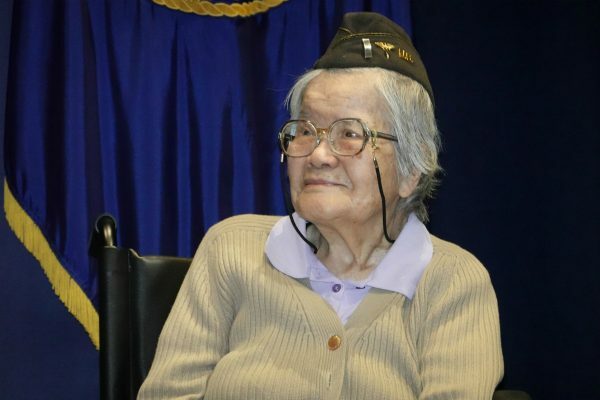 In late January, the centenarian was one of five Chinese-American WWII veterans to be awarded with the Congressional Gold Medal during a ceremony held at the Department of Veteran Affairs in Washington D.C on Jan. 29. “Your service to our nation … has been most amazing and wonderful, and the honor due to you now through the Congressional Gold Medal is well overdue,” said Secretary of Education Betsy DeVos at the ceremony. 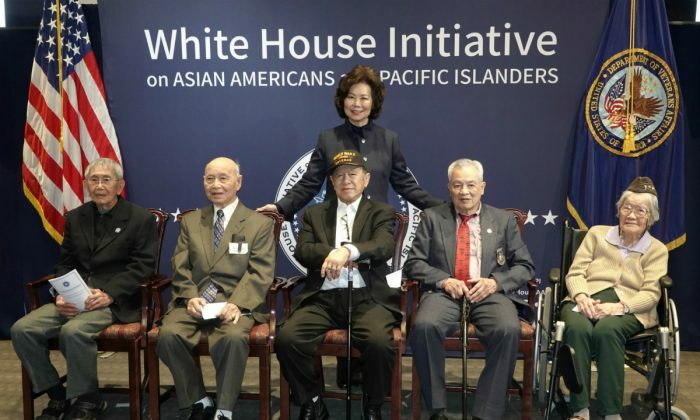 The honorees were the first Chinese-American veterans to be formally recognized with the highest civilian honor of the United States as part of an effort to honor nearly 20,000 Chinese-Americans who served for the U.S. military in WWII. In December, President Donald Trump signed the Chinese-American World War II Veterans Congressional Gold Medal Act into law, after it was unanimously passed by both houses of Congress. 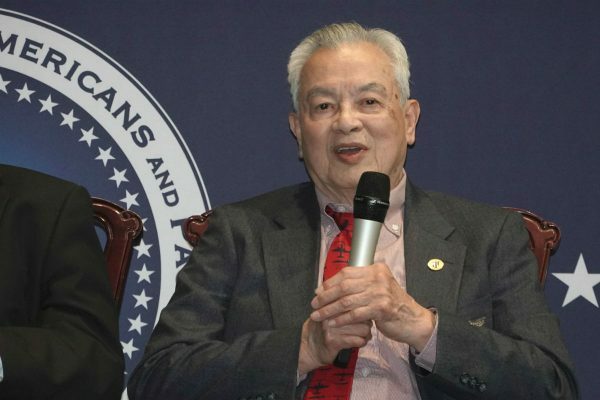 The law was passed as a result of a campaign spearheaded by the Chinese American WWII Veterans Recognition Project, a program of the National Chinese American Citizens Alliance. Seetoo was the oldest and highest-ranked veteran to be honored at the ceremony. Born in California, Seetoo and her family moved back to Xinhui in China’s southern Guangdong province when she was a teenager. After high-school, Seetoo trained to become a nurse in Hong Kong. In 1942, she walked 700 miles from Hong Kong to the city of Guiyang in southwest China to join the Chinese Red Cross Medical Relief Corps, where she worked in the operating room before becoming a medical trainer. In 1944, she joined the U.S. Army Nurse Corps as a first lieutenant. She became a member of the Air Service Command to the 14th Air Force, successor to the famed “Flying Tigers,” commanded by Major General Claire Chennault. She was also assigned to hospitals in the cities of Kunming, Chengdu, and Shanghai. Seetee returned to the United States after the war and settled in Washington D.C. after being discharged from the Army. With her husband Joseph Yuen, they raised four children, seven grandchildren, and eight great-grandchildren. 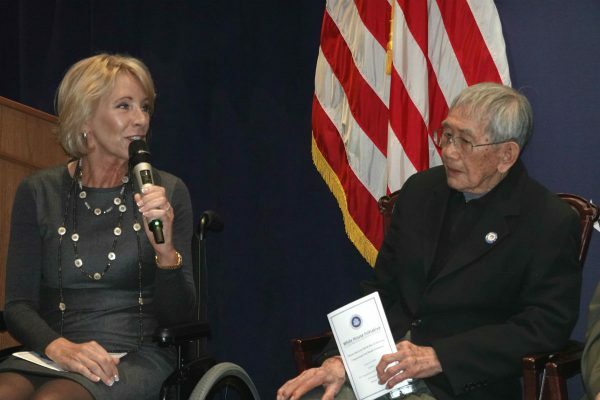 James Eng, Harry Jung, Henry Lee, and Robert Lee were also honorees at the ceremony, and were recognized by Veteran’s Affairs Acting Deputy Secretary James Byrne, Secretary of Education Betsy DeVos, and Secretary of Transportation Elaine Chao on behalf of the White House for their service. “They are heroic reminders that Asian-Americans are contributing to every part of mainstream America,” said Secretary of Transportation Elaine Chao. James Eng, 95, was also recognized at the ceremony. He was a petty officer in the U.S. Navy and was stationed in San Diego Naval Station, controlling the base’s radio station during the war. For the next three decades, Eng continued his service to the U.S. government, working for organizations including the Air Force, Army, and NASA. “America was wonderful to me,” Eng said, referring to his long career of service. Nearly one in five Chinese-Americans served in WWII, despite the fact that many faced discrimination, in part as a result of the Chinese Exclusion Act being in place. The Chinese Exclusion Act 1882 barred Chinese immigration to the United States and prevented non-U.S. born Chinese-Americans from being granted citizenship. The law was not repealed until the Magnuson Act in 1943. About 40 percent served without citizenship, according to the Veterans Recognition Project. Up until last December, Chinese-Americans were the only minority group not recognized with a Congressional Gold Medal for their service during WWII. Out of the approximately 18,000 Chinese-American WWII veterans, only about 50 are alive today, according to E. Samantha Cheng, Project Director of the Veterans Recognition Project. The honorees at the ceremony will receive their Congressional Gold members in October. With reporting by Lynn Lin.